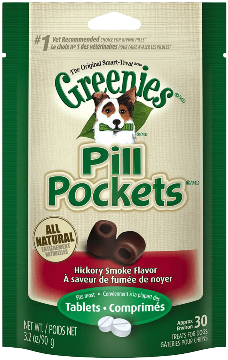 Greenies Pill PocketsTreats have built-in pouches to easily hide pills and ensure your dog takes their medication. These all-natural treats are a healthier alternative to using human foods, because they have fewer calories and less fat and sodium. Make pill-giving more enjoyable for both you and your dog. 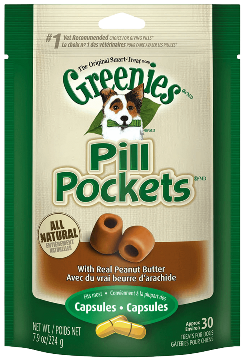 Greenies Pill Pockets treats for dogs are a proven solution to your pill-giving problem. These nutritious treats contain a built-in pocket, perfect for hiding a pill or supplement. Plus, dogs love the taste so much that they won't even notice there's medicine inside! 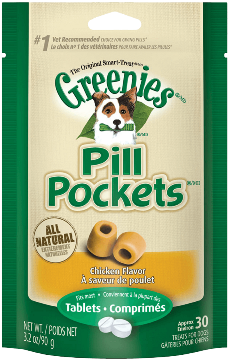 Recommended by veterinarians, Pill Pockets not only help with the delivery of medication, they are also a source of vitamins C and E to promote a healthy immune system. Pill Pockets treats come in convenient sizes to match your pill size. Large fits most capsules and small fits most tablets. Both sizes are available in beef and chicken flavors.